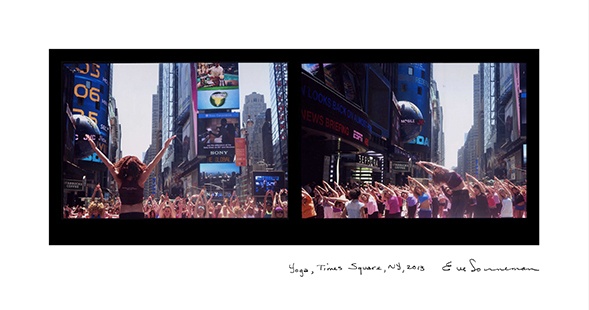 Eve Sonneman, Yoga, Times Square, New York, 2013. Digitally printed photograph on Japanese paper, diptych, edition of 10; 20 x 30 inches. © Eve Sonneman. Courtesy of Nohra Haime Gallery. Renowned American photographer Eve Sonneman is celebrated for her singular technique of pairing stills taken seconds apart, and presenting them side by side. In 1971, her career launched when she was included in the Young Photographers exhibition at the Museum of Modern Art, New York. Since then, she has continued to explore photography with an insightful talent; always observing the tiny, delicate changes occurring in a split second. For the last several years, Sonneman has explored a new body of work relating to the “Lightness of Youth,” her idea of exalting the contemporary experience lies within the observation and preservation of gestures and small changes in social communication. This exhibition provides ample poetry for this. Studying the details of our social rituals and cultural celebrations with an absolute delicacy, she captures the beauty of these moments and compiles them into a portfolio of American social landscape. Nearing the grounds of visual anthropology, her images become a collection of modern life stories. Lightness of Youth, continuing her signature style, was developed as a digital color series where the images represent an extension of her interest in the passage of time and involvement with human interaction. This series acts as a perpetuation of Sonneman’s advances in photography, developed and adapted to the technology and conceptual worries of our contemporary world. Eve Sonneman was born in Chicago. She has exhibited widely throughout the world and has received numerous grants. She participated in the 1977 dOCUMENTA and in the biennales of Venice, Paris, Strasbourg and Australia. Her work is represented in 43 museum collections, including the Museum of Modern Art; the Metropolitan Museum of Art; the Art Institute of Chicago; the Houston Museum of Fine Arts; the Centre George Pompidou, Paris; and the National Gallery of Australia, among others. She has published seven books, the most recent being La Ville Écrite, by Editions of Centre Pompidou, Paris. Sonneman currently lives and works in New York City. For more information contact Leslie Garrett at gallery [​at​] nohrahaimegallery.com or T +1 212 888 3550.